In 2016, the streets of Warsaw became a symbolic battlefield, and sound played a key role in this process. The voices of protest, the sounds of demonstration, and the amplification of resistance revealed the rumblings of power, the noise of disinformation, and the acoustic violence that has infected the sound organism of the city – an echo of both Polish and global political and ecological turbulence. The bilingual publication of Warsound|Warszawa collects the sound-related thoughts, observations, concerns and hopes of its authors. It is also a special kind of diary. Authors of the book have met this disquiet year within the frames of the Residencies Programme at CCA Ujazdowski Castle in Warsaw. Being sound artists, performers, activists and sound theoreticians, they perceive reality as a mixture of various waves and oscillations. They mix philosophy with acoustics, sound art with protest, and sound technology with resistance movements. Informed and communal listening can amplify empathy, solidarity, tolerance and respect for cultural diversity; it can de-emphasise social isolation and move us collectively towards mutual understanding, and in this way, become an impulse for change. 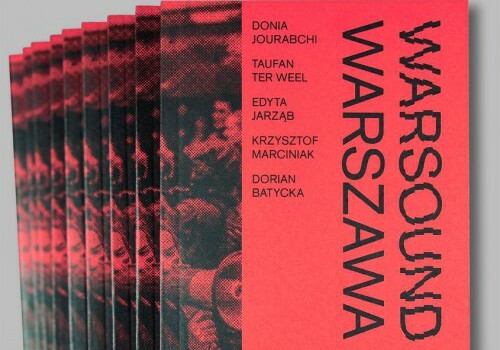 Sketches, essays, manifests and projects of the sound interventions collected in this publication are aimed to become a starting point for further investigations and activities, but Warsound|Warszawa can also be a guide for anyone interested in listening to politics, and the politics of listening.